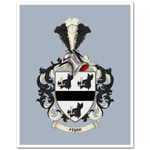 Our Family Crest Print includes a FREE Signed and Sealed Certificate of Authenticity. Expertly Hand Painted in a range of popular sizes, the perfect center piece for a living room or study. Keep an eye on those all important dates with this Family Crest Wall Calendar from Family-crests.com.